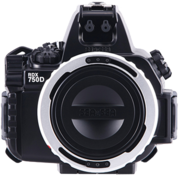 Feel free to take a peek into the world of underwater digital SLR photography. Camera Quick Shoe for easy mounting and removal of the camera. Mounting the camera becomes a breeze. You need only to slide the camera quick shoe into the slot, up to the designated position. There is almost no need for complicated position and gear alignments so even beginners can easily mount a camera. Simply by connecting the Fiber-Optic Cable (L-type)50107 to the connector, the light of the digital camera’s built-in flash is detected and connected to an external strobe. This is considerably less complicated than setting up an electrical connector that requires detailed knowledge. It also eliminates any risks involved when the connector is submerged in water. When using a YS Converter/C to enable the TTL auto adjustment, use a YS converter connector (6-pin connector) to connect it to a genuine SEA&SEA strobe. *In order to use it, a 5-pin Sync Cord/N must be attached to the strobe. Features a 0.5x pick-up viewfinder that makes it easy to see the whole field of view. 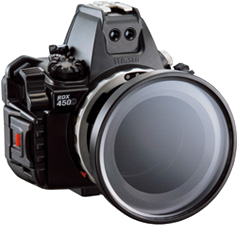 An optional exchangeable viewfinder can be selected as well. New type of easily operated shutter lever, excellent for quick snapshots and to avoid motion blur. The shutter lever can be operated in two ways – pushing from the top or pulling from the front – and offers a smooth halfway press for adjusting the autofocus so you need not worry about any missed chances. By attaching a Sea Arm VII Set22104 or similar set to the tripod socket at the bottom of the housing, up to two external strobes can be attached and used. When using the optional Grip-Stay L22108, you can hold the camera firmly with both hands just as you can with conventional housings. Strong and durable build, with a depth rating of up to 60 m / 200 ft.